In English, Castilian Spanish sometimes refers to the variety of Peninsular Spanish spoken in northern and central Spain or as the language standard for radio and TV speakers. In Spanish, the term castellano (Castilian) usually refers to the Spanish language as a whole, or to the medieval Old Spanish language, a predecessor to modern Spanish. Map of languages and dialects in Spain. The term Castilian Spanish can be used in English for the specific varieties of Spanish spoken in north and central Spain. Sometimes it is more loosely used to denote the Spanish spoken in all of Spain as compared to Spanish spoken in Latin America. 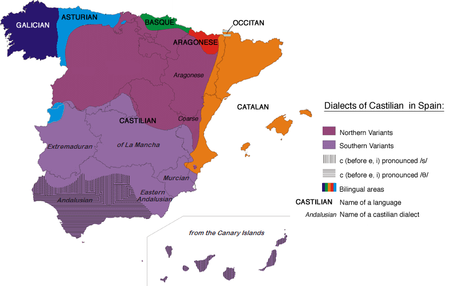 There are several different varieties of Spanish, which should not be confused with the other official and non-official languages in Spain, of which Castilian is only the most prominent because it is the only one that is official throughout the whole national territory. The term in Spanish for varieties spoken in Northern and Central Spanish would be castellano septentrional ("Northern Castilian"). Español castellano, the literal translation of Castilian Spanish, while not being a common expression, would be understood literally and would refer only to varieties found in Castile itself. The varieties found, for instance, in Aragon and Navarra would be excluded even though they belong to castellano septentrional. Northern Spanish (northern coast, Ebro and Duero valleys, upper Tajo and upper Júcar valleys). The dialects in this area are sometimes called Castilian Spanish (only in English), but in fact it excludes quite a large portion in the historical region of Castile and includes areas not in it. Transitional area between North and South (Extremadura, Murcia, Madrid, La Mancha). The dialects in this area have traits which are often popularly associated with Andalusia, such as implosive s-aspiration (systematic or conditioned by context). Extremadura and Murcia are often lumped into a Southern variety with Andalusian rather than being considered a part of the transitional area, since Southern traits are more pervasive there. The Real Academia Española (Royal Spanish Academy or RAE) defines Castilian Spanish as a standard language, and many speakers accept RAE as the governing body of the language. However, some traits of the Spanish spoken in Spain are exclusive to that country, and for this reason, courses of Spanish as a second language often neglect them, preferring Mexican Spanish in the United States and Canada whilst European Spanish is taught in Europe. Spanish grammar and to a lesser extent pronunciation can vary sometimes between variants. The most striking difference between dialects in central and northern Spain and Latin American Spanish is distinción (distinction), that is, the pronunciation of the letter z before all vowels, and of c only before e and i, as a voiceless dental fricative /θ/, English th in thing. Thus, in most variations of Spanish from Spain, cinco (five) is pronounced /ˈθinko/ as opposed to /ˈsinko/ in Latin American Spanish, and similarly for zapato, cerdo, zorro, Zurbarán. Distinción also occurs in the area around Cusco, Peru, where [θ] survives in a few words like the numbers doce, trece and, with some people, in the verb decir. The widespread use of le instead of lo as the masculine direct object pronoun, especially referring to people. This morphological variation, known as leísmo, is typical of a strip of land in central Spain which includes Madrid, and recently it has spread to other regions. In the past, the sounds for "y" and "ll" were phonologically different in most European Spanish subvarieties, compared with only a few dialects in Latin America, but that difference is now disappearing in all Peninsular Spanish dialects, including the standard (that is, Castilian Spanish based on the Madrid dialect). A distinct phoneme for "ll" is still heard in the speech of older speakers in rural areas throughout Spain, but most Spanish-speaking adults and youngsters merge "ll" and "y". In Latin America, "ll" remains different from "y" in traditional dialects along the Andes range, especially in the Peruvian highlands, all of Bolivia and also in Paraguay. In the Philippines, speakers of Spanish and Filipino employ the distinction between "ll" /ʎ/ and "y" /ʝ/. In most of Latin America, usted is used more often than in mainland Spain; however, in Latin America, this tendency is less common among young people, especially in Caribbean dialects. In Castilian Spanish, the letter j as well as the letter g before the letters i and e are pronounced as a stronger velar fricative /x/ and very often the friction is uvular [χ], while in Latin America they are generally guttural as well, but not as strong and the uvular realizations of European Spanish are not reported. In the Caribbean, Colombia, Venezuela, other parts of Latin America, the Canary Islands, Extremadura and most of western Andalusia, as well as in the Philippines, it is pronounced as [h]. Characteristic of Spanish from Spain (except from Andalusia and the Canary Islands) is the voiceless alveolar retracted sibilant [s̺], also called apico-alveolar or grave, which is often perceived as intermediate between a laminal/dental [s] and [ʃ]. This sound is prevalent also in Colombian Paisa region, and Andean Spanish dialects. Debuccalization of syllable-final /s/ to x, [h], or dropping it entirely, so that está [esˈta] ("s/he is") sounds like [ehˈta] or [eˈta], in different degrees and contexts, occurs in Castile–La Mancha (except North-East) and Madrid; this is most common in southern Spain (Andalusia, Extremadura, Murcia, Canary Islands, Ceuta, and Melilla), and some parts of Latin America. The meaning of certain words may differ greatly between both dialects of the language: carro refers to car in some Latin American dialects but to cart in Spain and some Latin American dialects. Sometimes there also appear gender differences: el PC (personal computer) in Castilian Spanish and some Latin American Spanish, la PC in some Latin American Spanish, due to the widespread use of the gallicism ordenador (from ordinateur in French) for computer in Castilian Spanish, which is masculine, instead of the Latin-American-preferred computadora, which is feminine, from the English word computer (the exceptions being Colombia and Chile, where PC is known as computador, which is masculine). Also, speakers of the second dialect tend to use words and polite-set expressions that, even if recognized by the RAE, are not widely used nowadays (some of them are even deemed as anachronisms) by speakers of Castilian Spanish. For example, enojarse and enfadarse are verbs with the same meaning (to become angry), enojarse being used much more in the Americas than in Spain, and enfadarse more in Spain than in the Americas. 1Many of the vocabulary examples are used throughout Spain and not necessarily specific to just Castilian Spanish. 2Latin American Spanish consists of several varieties spoken throughout the Americas so the examples may not represent all dialects. They are meant to show contrast and comparing all variants of Latin America as a whole to one variant of Spain would be impossible as the majority of the vocabulary will be reflected in other variant. ^ "Encarta World English Dictionary". Bloomsbury Publishing Plc. 2007. Archived from the original on 2009-10-31. Retrieved 2008-08-05.